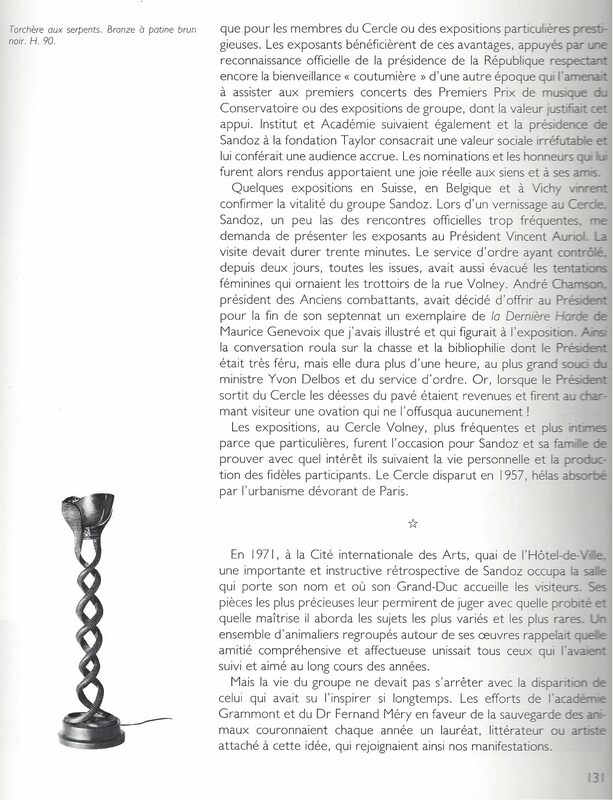 Édouard-Marcel Sandoz (1881-1971) was born in Basle, Switzerland, and was the son of the founder of Sandoz Bale SA, a large pharmaceutical company established in 1886. He began drawing lessons and developed an interest in sculpture while studying under Dr Favrod-Coune in the village of Vaud, Chateau-d’Oex. 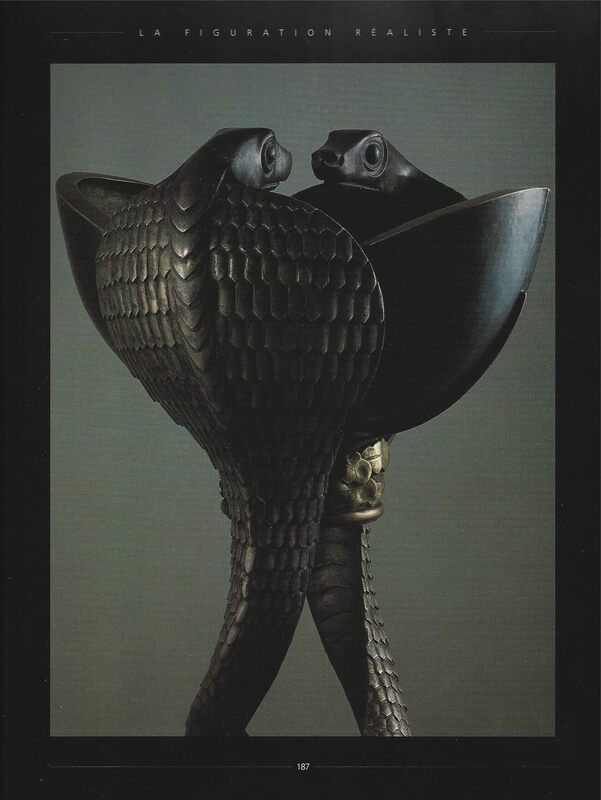 He attended the École des arts Industriels in Geneva from 1900-1903, studying sculpture under B. Caniez and A.-J. Huguet, and ceramics under J. Mithey. 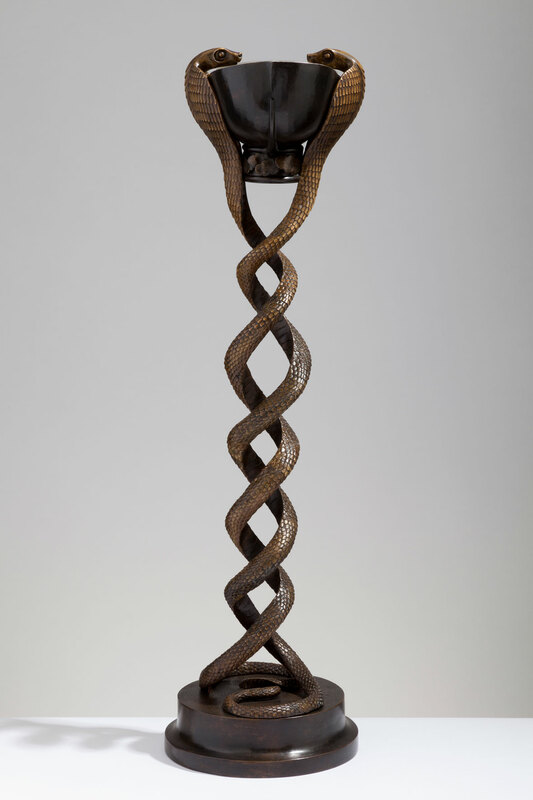 This was a significant period in his development where he learned the importance of discipline and reflection on the past, in relation to his own work. In 1904 Sandoz left for Paris, where he was apprenticed to the painter Fernand Cormon and the sculptors Jean Antoine Injalbert and Antonin Mercié, while attending classes at the École des Beaux-Arts. 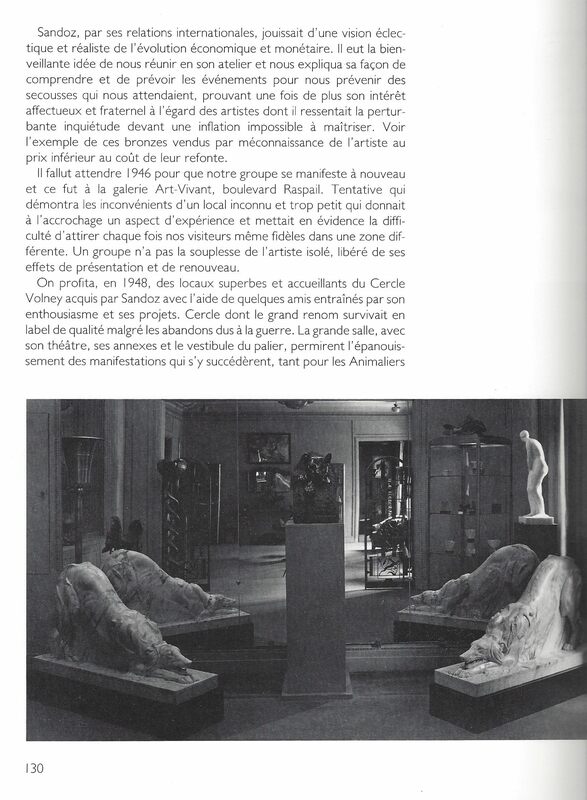 Two years later Sandoz exhibited his work for the first time at the Salon of the Société Nationale des Beaux-Arts. After the First World War (during which he served in the artillery), Sandoz returned to Paris to live at 171 boulevard Montparnasse, with a studio at 2 villa d’Alésia. In 1921, he took several trips to North Africa, experiences which must have influenced his style and his choice of animalier subjects. 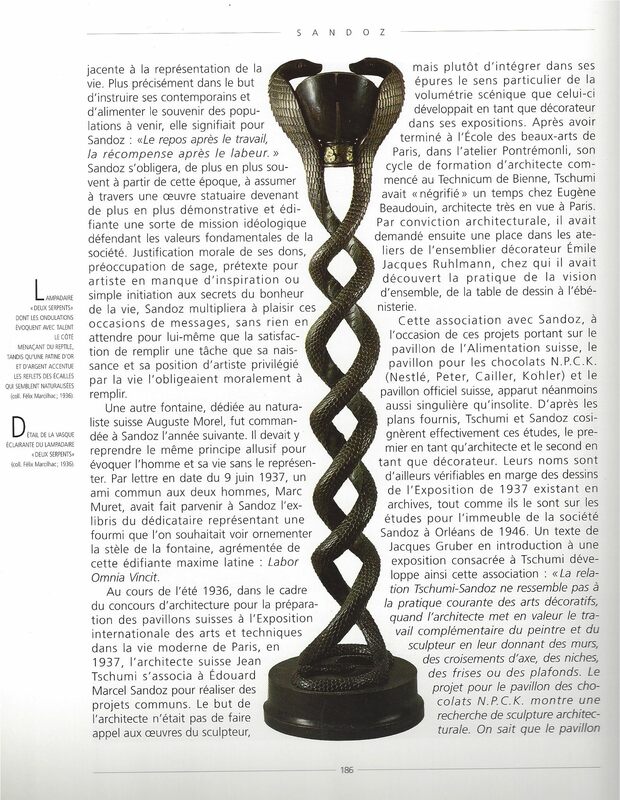 As a member of the Société Nationale des Beaux-Arts in the 1920s, Sandoz exhibited internationally and was awarded a grand prix at the 1925 Exposition Internationale in Paris. 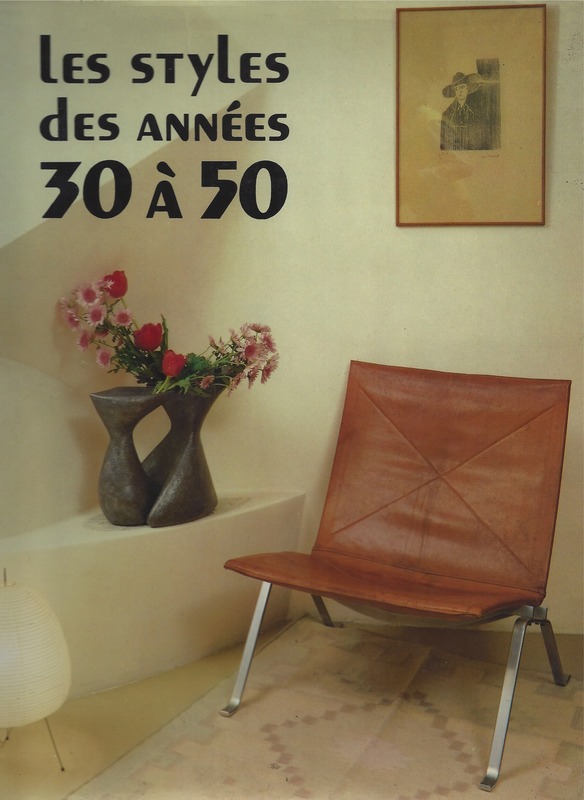 He also participated in both the French and the Swiss pavilions at the 1939 New York World’s Fair. His increasing success enabled him to follow a prosperous path to Salon recognition with his animalier pieces. 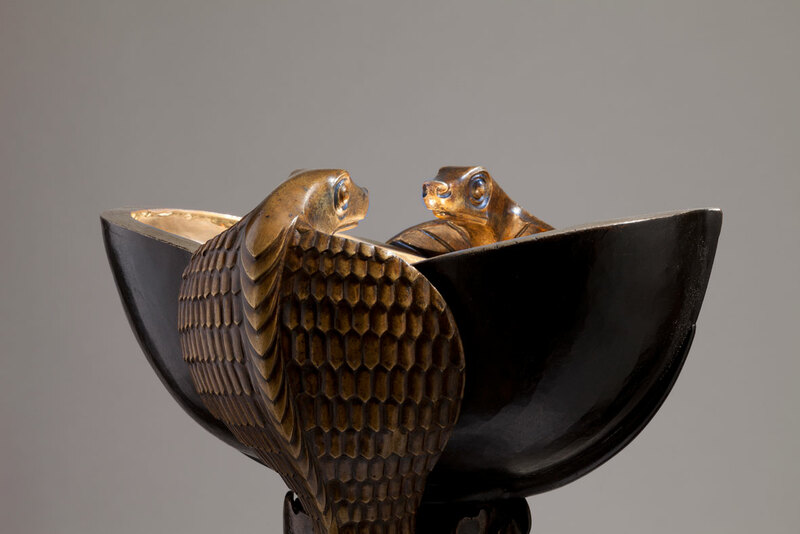 During the 1930s and 1940s, he was awarded prestigious prizes for his sculpture such as the grand prix at the Exhibition of Gand. 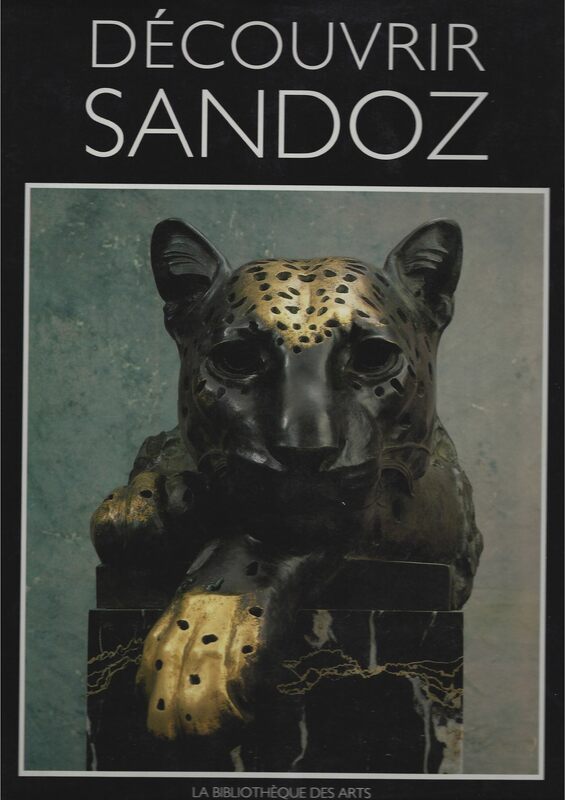 Sandoz is remembered especially for his animalier studies rendered in a poignant and often humorous personal style. 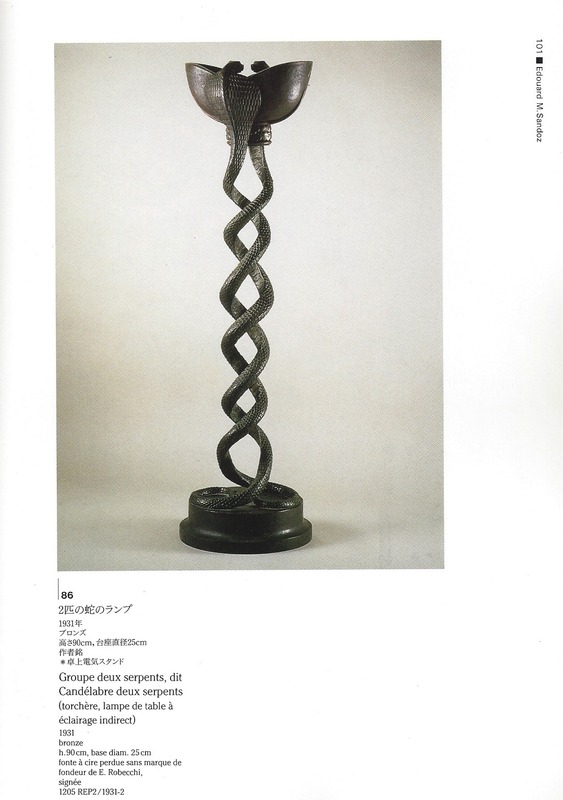 An adherent of direct carving, he interchanged materials frequently in his search for optimum effect. 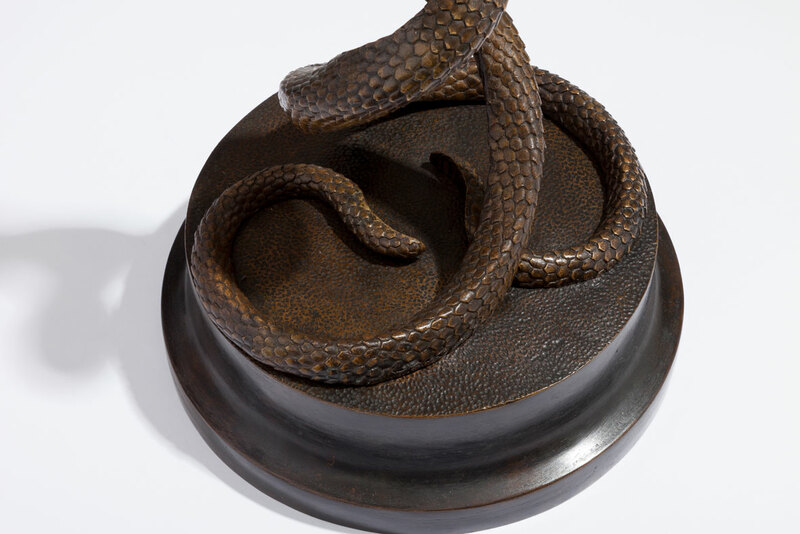 Works produced in bronze were cast by Valsuani, the Parisian founder, using the cire perdue process. 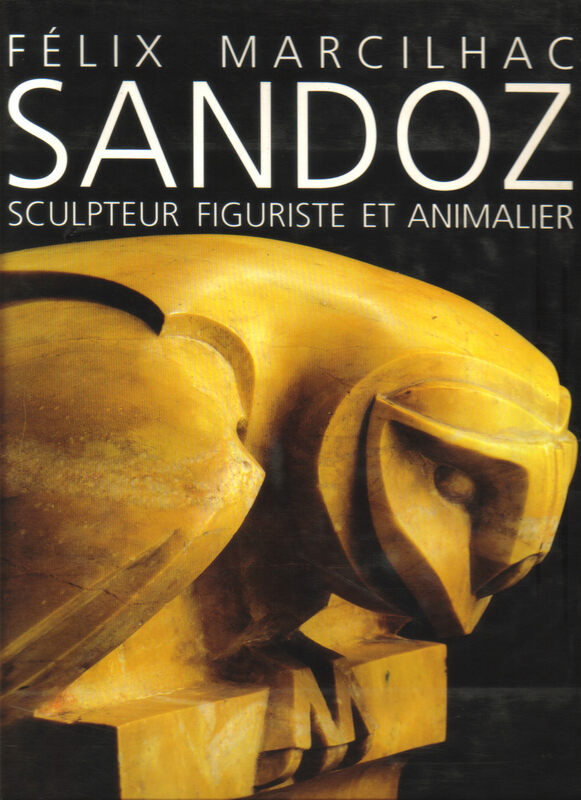 Sandoz was astute in combining the characteristics of the animal he was modelling with the nature of the material he was using, to create sculpture that was innovative and ahead of its time. 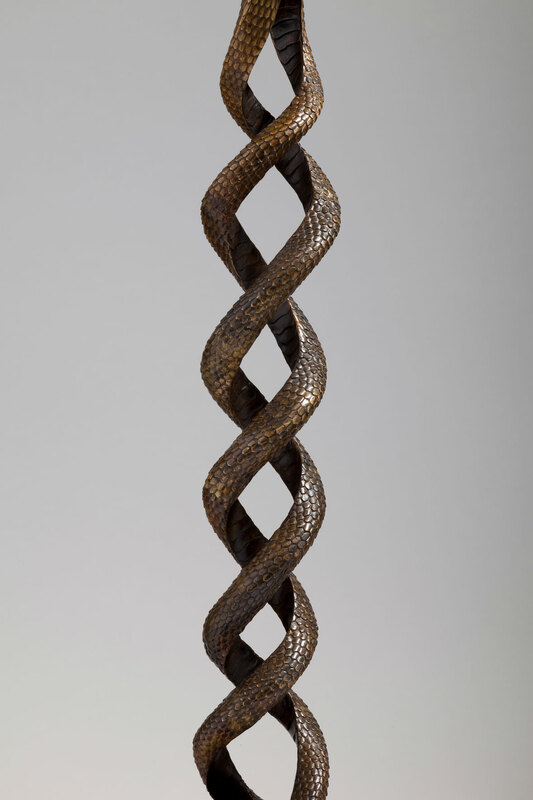 Visual representations of snakes may be traced back to the Palaeolithic period. 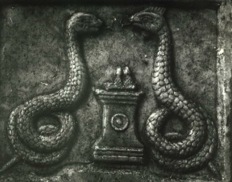 Snakes were worshipped in many ancient cultures, including those of Egypt and Greece, where they had religious significance. Egyptian pharaohs wore the uraeus, the figure of the sacred asp or cobra, on their crowns, and uraei were depicted in temples and tombs to ward off enemies. 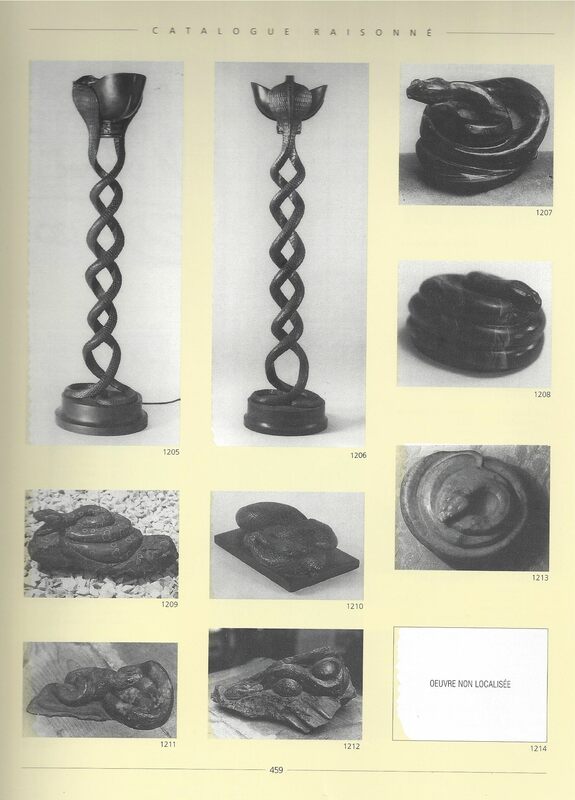 The discovery of Tutankhamen’s tomb by Howard Carter in 1922 encouraged the fashion for this and other exotic animal motifs.For the decorative artist, the snake is an evocative creature with a malleable form that may be twisted into handles or lengthened for lamps or vases. 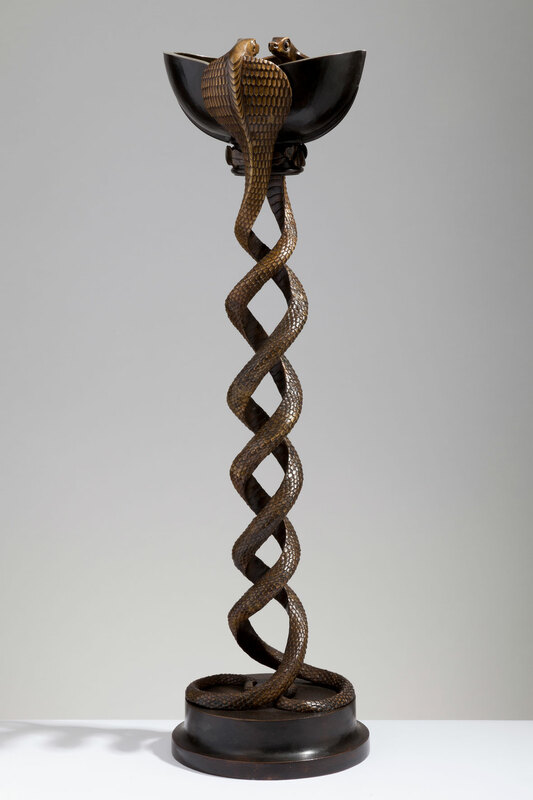 The cobra with its dilated throat, often seen in Egyptian works, seemed to Sandoz ideal for dramatic expression in bronze while lending itself to employment as a lamp. 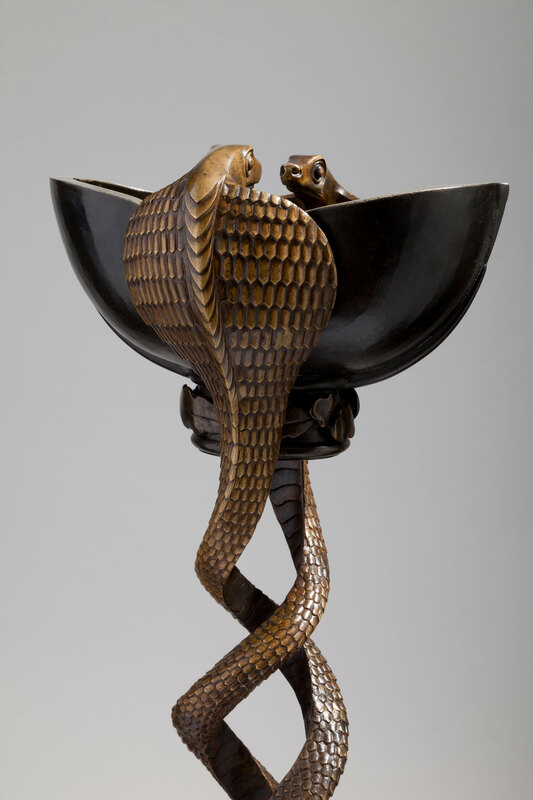 He may also have been influenced by Jean Dunand, who in 1913 and 1919 had exhibited copper vases flanked by cobras and individual bronze sculptures of snakes. 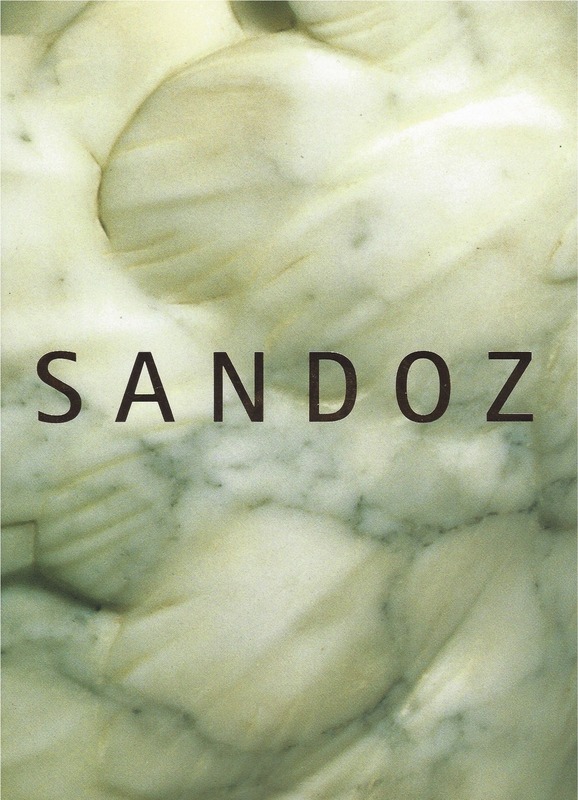 Works by Sandoz can be found in the collections of the Musée d’Orsay, the Metropolitan Museum of Art, New York, and the Museum of Fine Arts, Boston. Hélène Rochas, the widow of couturier Marcel Rochas and former CEO of the fashion house Rochas, acquired an impressive art and antiques collection, which was housed at her Parisian apartment on Rue Barbet-de-Jouy in the 7th arrondissement. The apartment, which symbolised the height of Parisian elegance and taste, demonstrated Rochas’ exceptional skill in blending classic and contemporary elements. 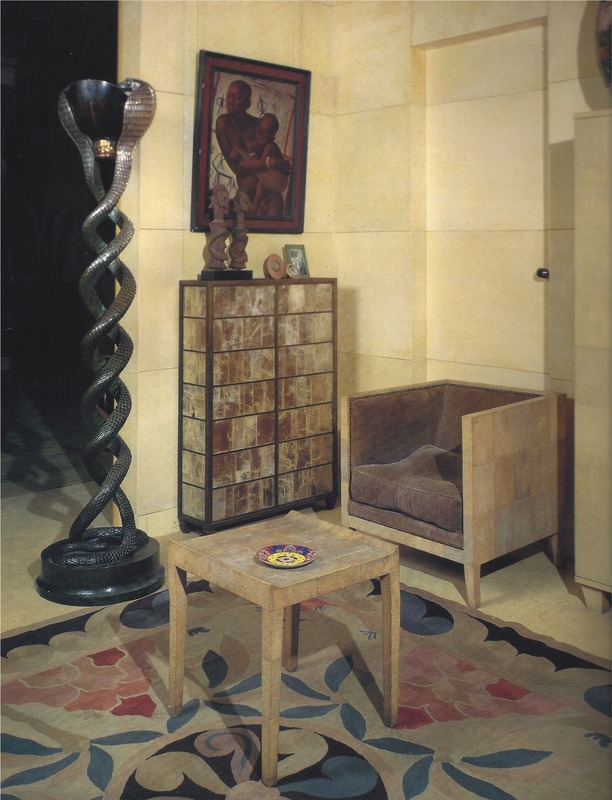 The original interiors were conceived by her husband, Marcel Rochas, and his decorator, Georges Geffroy. In the decades following the couturier’s untimely death in 1955, Hélène Rochas made it her own, influenced by the subsequent men in her life – the film agent André Bernheim and aristocrat Kim d’Estainville, who sparked her interest in Art Deco. Living in her apartment for more than 60 years, the model-turned-businesswoman-turned-socialite amassed an extraordinary and exquisite collection of art and furnishings. She is still considered the epitome of Parisian chic.